Historical Types is based on a smart concept: an annotated picture book of enlargements of typefaces to show how they really look. After all, type is that tiny code we look at without really seeing it: it gives meaning to thoughts, but we rarely give it a thought. Obviously this approach -- enlarged images of letterforms with commentary -- has been a key part of modern typographic education. A lantern slide show by Emery Walker in 1888, given to the Arts & Crafts Exhibition Society in London, where he projected blown-up images of Jenson, Ratdolt and Rubeus pages, inspired William Morris to start his own press. Walker, a commercial photo-engraver, went into partnership with T J Cobden-Sanderson to start the celebrated Doves Press after Morris' death. Bruce Rogers, who also knew Walker, had photo-enlargements of the Jenson pages made to draw his Centaur type. As a teacher I rely on large projected letterform details to explain their subtleties. I often use images from a wonderful article, "Photographic enlargements of type forms" by Philip Gaskell, that was published in the Journal of the Printing Historical Society, no 7, 1972 (and is missing from Knight's bibliography). Gaskell's photos, which were printed 5 times actual size, have proven enormously useful in discussing type design and its evolution and are a significant precursor to what Knight has done. However didactic his aim, Knight has not achieved the same compression and intensity that Gaskell did (in 11 pages! ), perhaps because his book is aimed halfway between scholars or students and a general audience. But Knight has provided accurate information on these typefaces. This may sound odd, given that so much has been written over the last five centuries about the legacy of Gutenberg, Fust & Schoeffer, Jenson, and so on. But we have discovered a lot of it is speculative or inaccurate and we can no longer rely on Stanley Morison, Beatrice Warde and D B Updike for facts about the design of type. In discussing Ratdolt's work, Knight cites studies from 2009 and 2011 (showing how type scholarship is constantly evolving). Fortunately we have James Mosley, who teaches at Reading, Charlottesville (Virginia) & London Universities, formerly the Librarian of Saint Bride's in London, as a guiding light in the search for typographic truth. Mosley has been blogging about such matters since 2006. His "typefoundry" blog has been a great resource for Knight, particularly in the untangling of Jannon versus Garamond, the actual spelling of Garamont's name, and other details. Many documents have appeared to further the historical discussion, from the series of Type Specimen Facsimiles (under the editorship of John Dreyfus from 1963 onward), to the exemplary Enschedé (1993) & Plantin-Moretus (2004) facsimiles edited by John Lane. 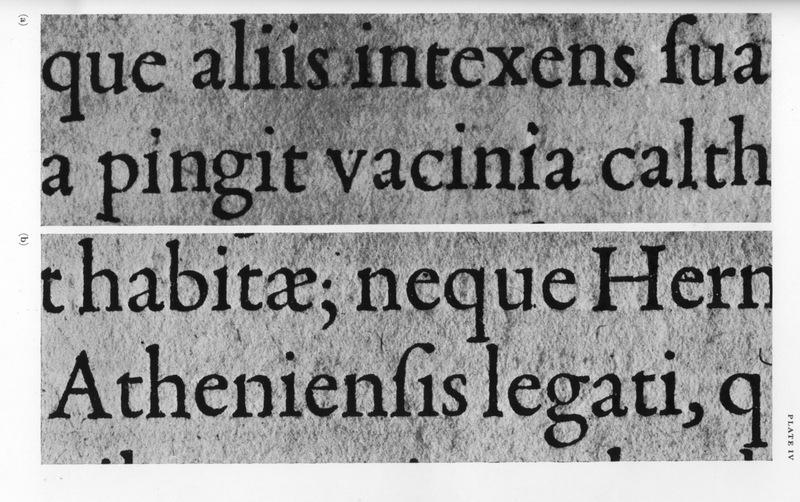 Some of the older facsimile works could be revisited with the new approach heralded by Knight, for example the 1592 Egenolff-Berner specimen sheet which was reproduced in 1920 by Gustav Mori in collotype. That sheet was the first specimen broadside to clearly identify Garamond and Granjon as cutters of their types and, as it was printed from newly cast type, was the best possible source for modern interpretations: Adobe Garamond by Robert Slimbach (among others) was drawn from it. But for most of the twentieth century Garamond revivals (and there have been roughly a zillion of them) were based on the wrong type: a poor imitation cut by Jean Jannon in the French province of Sedan in the 1620s. This typographic Lady Gaga, a tragi-comic homage to classic typefaces, should have been left in the dustbin of history but accidentally gained an important place in the story of type development, so Knight has included it. Also included is a text debunking many of the myths about Jannon and Garamond (thanks to Mosley's research). One of the most fanciful stories has Cardinal Richelieu's troops looting Jannon's types to bring them back to the Imprimerie nationale in Paris. This yarn was first spun by Beatrice Warde in 1926 and picked up by Warren Chappell in his Short History of the Printed Word. As late as 1999 Canadian poet Robert Boringhurst was embroidering the fable in his edition of Chappell's book (p. 148), saying that after Richelieu’s armies seized Jannon’s type they felt bad about it so they reimbursed him for them! As technology improves it greatly assists us in seeing what we are looking at (though collotype mentioned above is hard to beat). Up to now many books on type have used small illustrations of large pages shrunk down, printed from line blocks. In the end you cannot see any details. So the next step is to do more books of this kind that show, as closely as possible, the impression and the texture of the paper, and more specialized books. Knight's previous book was Historical Scripts (also from Oak Knoll) with a similar hyper-visual approach to the history of calligraphy. Hendrik Vervliet's recent three volumes on the Paleotypography of the French Renaissance have illustrations from Xerox copies and photostats. [Aside: I published Vervliet's monograph on Robert Granjon: Cyrillic & Oriental Typography in Rome at the End of the Sixteenth Century in 1979. We relied on Velox photostats from the Vatican for illustrations, which were so poor, some were even out of focus, but how do you tell the Vatican their reproductive services are lacking?] Vervliet's images (many composites to show full character sets) were painstakingly assembled over decades and often Xerox was the only service available. It would be a useful task for someone to give the blow-up treatment (shot in high resolution with raking light to show the impression, as well as the paper surface) to his studies (now that we have the key data assembled), and then move into the following centuries. Nevertheless Vervliet's work is the major contribution to the field in the last half century. 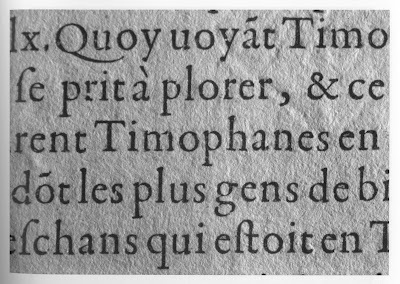 So it's great to see late-breaking news from the sixteenth century when Knight reproduces a page of revolutionary new type from Henri Estienne (previously attributed to Garamond [see top illustration]) and, thanks to Vervliet, we now have to acknowledge the shadowy Maître Constantin for this massive step-forward in the Aldine style which revolutionized roman letterforms across Europe. I myself have done a little work in the eighteenth and nineteenth centuries but that indicated to me how much more needs to be done. Knight himself admits this is just a start: "Some worthy type designers like Pierre Haultin, Hendrik van den Keere, and Antoine Augereau are missing. But as well as the more famous names of Gutenberg, Granjon, and Bodoni, I have been able to include some lesser-known designers like Erhard Ratdolt, Simon de Colines, Johann Fleischman, and Alexander Phemister." While to me there seem to be some close calls on who got omitted versus who got in, I think the general reader will enjoy the familiar mixed with the more exotic. The reader may balk at the name Miklós Tótfalusi Kis and be unaware that they have been lôôking at his type and versions of it all their lives. 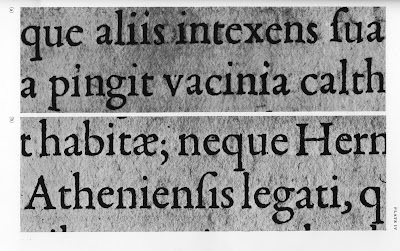 In compressing info Knight has mixed up the legacy of Caslon: Mrs Elizabeth Caslon did not start the H W Caslon Foundry, that was 30 years later, and I really don't agree with using italic parentheses! For the most part the photos are excellent and give us true insight into the intricacies of these typefaces. 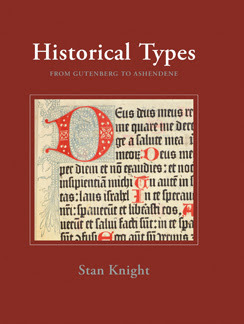 For all of its superficial appearance as a "coffee-table" book on printing types with pretty pictures, Knight's work is a solid piece of scholarship and corrects a lot of misconceptions found in "standard" texts that give a resumé of the development of printing types.